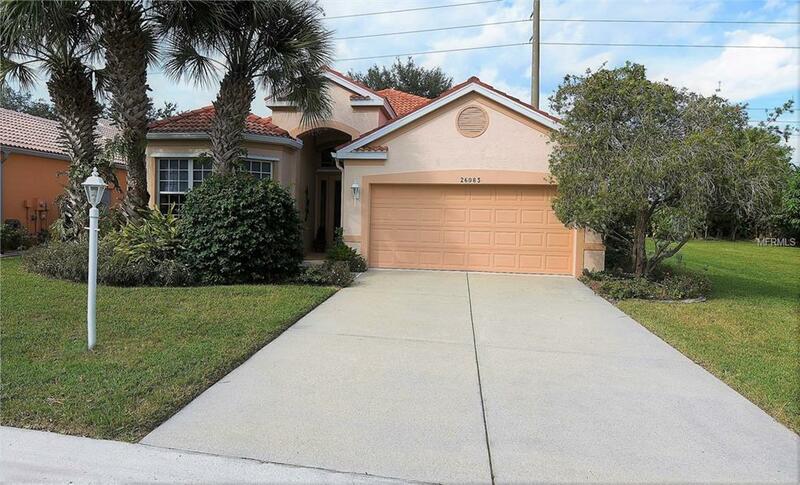 ** PLEASE ENJOY THE 3D INTERACTIVE VIRTUAL TOUR ASSOCIATED WITH THIS LISTING **Seminole Lakes Waterfront Sporting a popular and efficient great room design, this split bedroom plan home was built strong for the original owners in 2003. With approximately 1950 square feet of air-conditioned living space, this residence has three bedrooms, two full baths, a two car attached garage and a covered/screed lanai with access from the great room and master bedroom. The lanai and backyard enjoy a private setting with the North side-yard comprised of a large, grassy utility easement. Features of this home include mature tropical landscaping, a glass front entrance door, 12 ceramic tile floors in all but the one carpeted guest rooms and 10 ceilings throughout. The open kitchen has ample cabinetry, laminate surface counters, a closet pantry and newer stainless appliances (2014). With just shy of 500 single-family homes, Seminole Lakes is a fully developed golf and tennis community which is located just four miles South of historic downtown Punta Gorda. Considered "maintenance free, the low monthly fees include lawn care, gated security, a community pool, and tennis courts. The fee also includes community roads and lake maintenance. Individual homeowners are responsible for their home and shrubbery care. The community features include eight freshwater lakes, the largest of which is nearly 25 acres, and access to the Seminole Lakes Golf Club, which is a semi-private 18 hole executive course. Additional Lease Restrictions Application For Lease Must Be Association Approved.